SHERYL AND I spent the weekend in suburban Denver, Colorado, with my sister and her awesome family. We had a great time doing very little of anything. I played some bad golf and made sure to support the local cigar shop. Sheryl bought some chocolate and two very pretty glass art pieces. Chilling with EY and Castle in CO! It was nice to get away while Steve Rees manned Second String Music (and sold some stuff!). The only stress came from traveling, but even that was minimal. We hear horror stories about long TSA lines and flights being delayed. Our trip was smooth and the security lines weren't very long. Sheryl wasn't happy about her toothpaste being confiscated in Denver, but not in St. Louis. Maybe Missouri feels more strongly about taking care of your teeth. 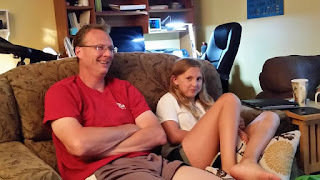 On Sunday night we chilled and I watched several episodes of "Castle" with Erin, my sister's daughter. No big deal to me, but to Erin, apparently it was. "You might be surprised. 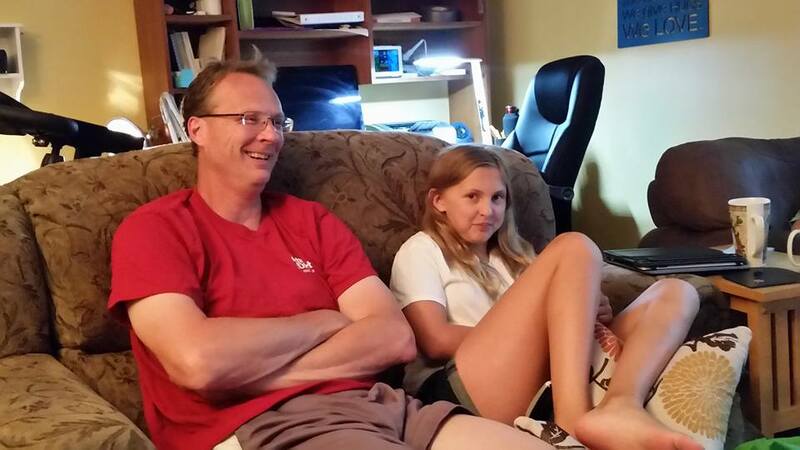 She'll remember watching Castle with her big dorky Uncle RotKnee," my sister said. So here is to making memories, stress-free travel and spending time with family. Now it's back to the shop, not working for a living and rocking the rest of the summer away.